Nokia has branched out and begun aiming full touchscreen feature phones at the budget and emerging markets. Although Nokia is struggling to gain a decent market share in the smartphone industry, it's still number one when it comes to feature phones, and this new range looks to close the gap between the two sectors. Nokia said: "These latest phones have been designed to provide an incredibly rich, smartphone-like experience to consumers who want to be set free from excessive data consumption costs and short battery life." The three handsets run Nokia's home-brewed Series 40 operating system, which takes design cues from the ill-fated MeeGo OS which made a brief cameo on handsets such as the Nokia N9. 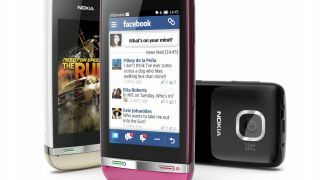 We saw leaks of the Nokia Asha 311 back in May – sporting that MeeGo-esque user interface and we now know that it will have a single-core 1GHz processor, 3-inch (320 x 240) screen, 3.5G network connectivity, microSD card slot and a 3.2MP camera with QVGA video recording. The Asha 305 and Asha 306 are identical, apart from the 305 offering dual-SIM capabilities. They pack a 3-inch (400 x 240) display, 2G network connectivity, microSD card slot and a 2MP camera with QVGA video recording. Ok, so specification-wise the trio are underwhelming, but these feature phones do have two big plus points: battery life and price. Nokia reckons the 1,110mAh battery in the Asha 311 will offer up a whopping 781 hours of 3G standby time and 4.5 hours of 3G talk time, while the 305 and 306 handsets offer 528 and 600 hours of standby respectively. Then comes the cost – Nokia has slapped the low, low price of €63 (around £50) on the Asha 305, which is expected to ship sometime in the second quarter of this year, while the Asha 306 and Asha 311 will roll out in the third quarter, flaunting tags of €68 (around £55) and €92 (around £75). Nokia was unable to confirm if any of these handsets would make it to UK shores, but if they do, they could be the perfect devices for first-time users, or as backup handsets.